The Cancer Companion: Juicing--Get your Greens in! If there were one message I could pass along to ANYONE--whether you be in perfect health, wanting to be more healthy, or fighting disease--it would be to incorporate more greens into your diet every single day. I have said it before in this blog, but the point really can't be over-emphasized: eating an abundance of dark leafy greens equals better health. You can reduce your risk of cancer by 60% by eating dark leafy greens every day. Over 200 scientific studies have shown that dark leafy greens have the most consistent results of any food in reducing your cancer risk. Dark leafy greens also are rich in iron, magnesium, zinc, calcium, and they raise the spirits and boost your immunity. When he drank this, Garth said, "THAT is like happiness in a glass!" 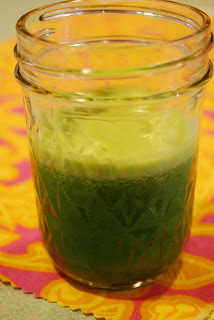 -Place all ingredients into the juicer, as per the manufacturer's instructions, and juice! -Makes two small glasses juice. -Leftover pulp is great for your composter! REMEMBER: Every day, think to yourself, "When will I have my greens?"